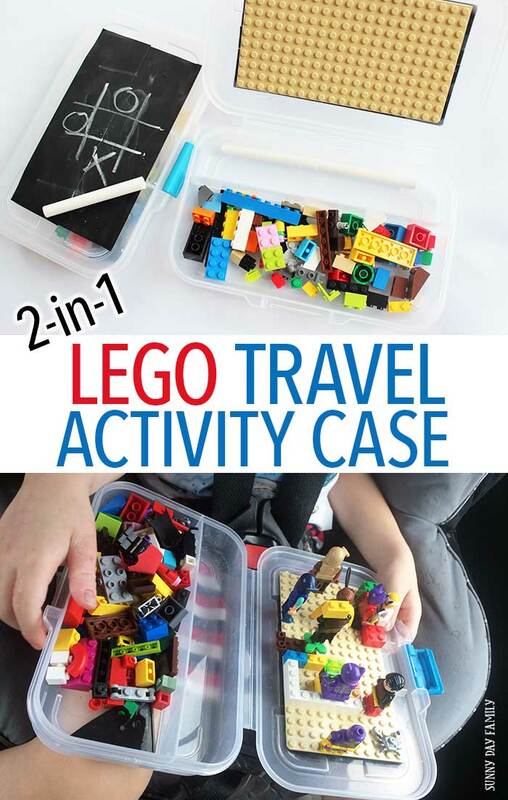 It's easy to make this LEGO travel activity case with a top that's perfect for drawing too. It's my son's version of "are we there yet?" and he asks it constantly when we are in the car. Which is fine for a 10 minute drive to the store, but for our 4 hour drive to the beach, I knew I would go insane before we even hit the highway. I needed something to keep him (and his brother) busy in the car, so I cruised the aisles of Target looking for inspiration. Because the aisles of Target always have inspiration, right? I found exactly what I needed in the school supplies aisle with a $2 pencil box. 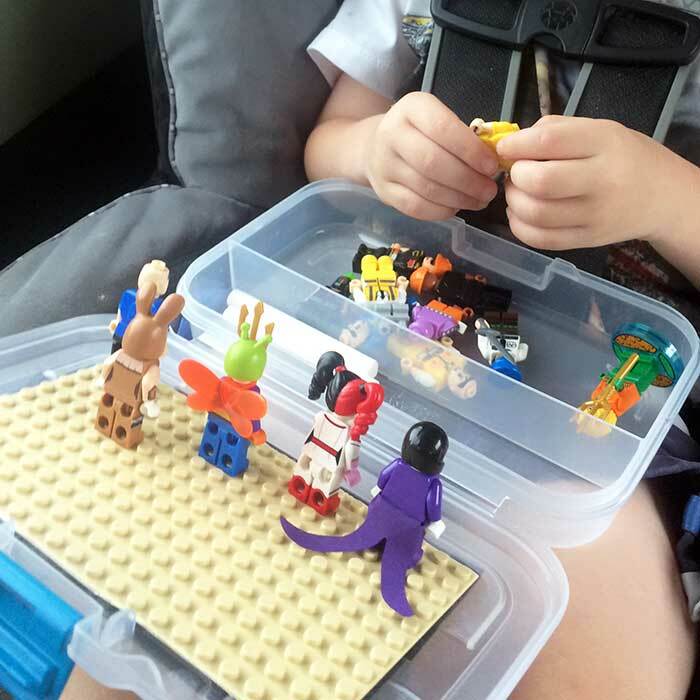 Knowing that my boys could spend hours at home building on their LEGO table, a portable LEGO kit was just the thing to keep them occupied on our road trip. With a few inexpensive supplies and about 10 minutes, I created two awesome LEGO kits that my boys LOVE (and played with for our entire vacation). Plastic Pencil Case - I found mine for $2 in the school supply aisle at Target. Here's the one I used on Amazon for reference, or you can likely find something very similar at any discount or office supply store. Make sure it has a good latch! 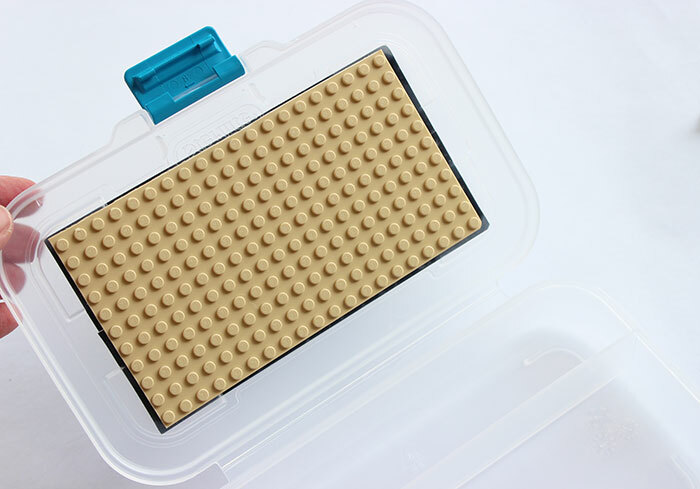 LEGO Baseplate - I used a sand colored one for our beach trip, but you can also go with classic green. I wanted to add a little something extra to make our LEGO kit dual purpose, so I covered the top with chalkboard tape. This is a fun addition to let my kids draw or play tic-tac-toe when they need a break from building. 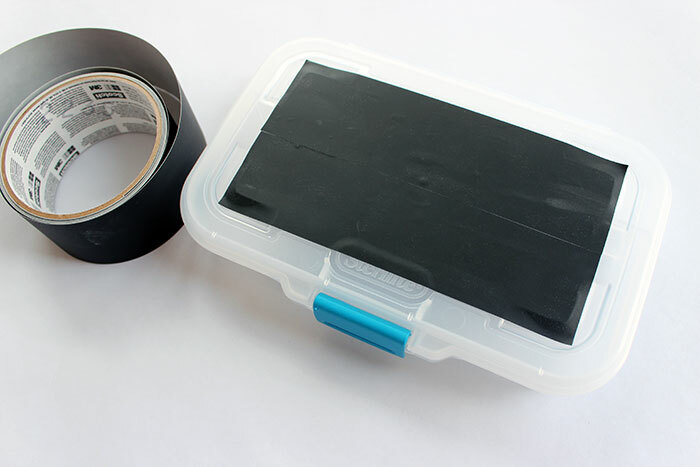 Start by cutting your chalkboard tape into two strips to cover the top of your pencil box. Carefully lay the tape down on the top and smooth out the seams. 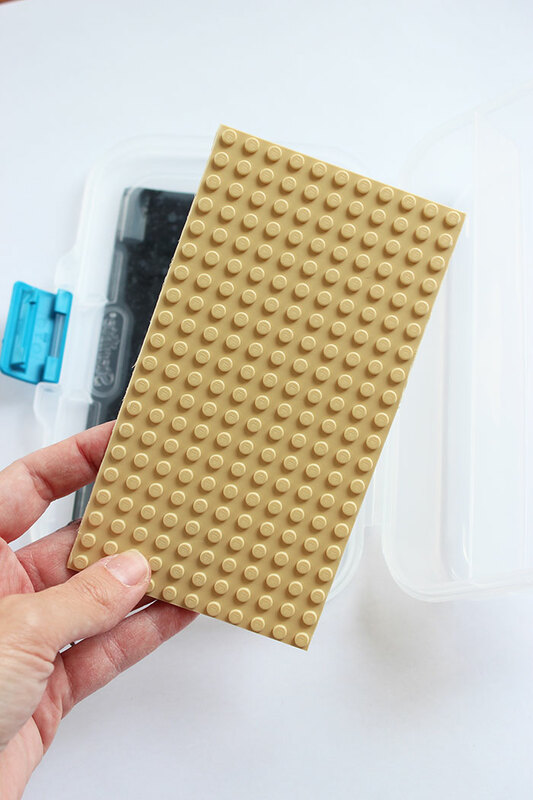 Next, measure the inside lid of your box and cut your LEGO baseplate to fit. I was able to make two cases with one baseplate (with a little left over). 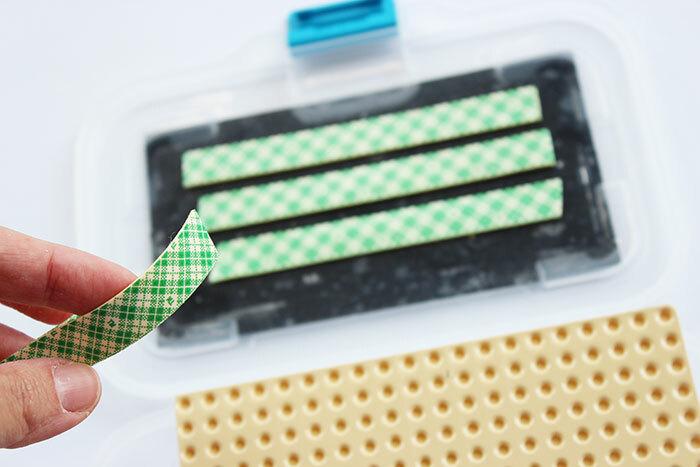 The baseplate cuts easily with scissors. 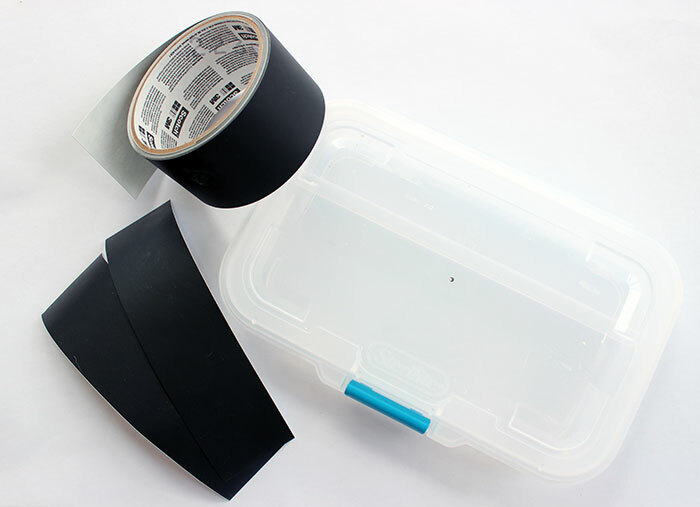 Use mounting tape to adhere the baseplate to the inside of the lid. Press firmly to ensure it sticks. That's it! 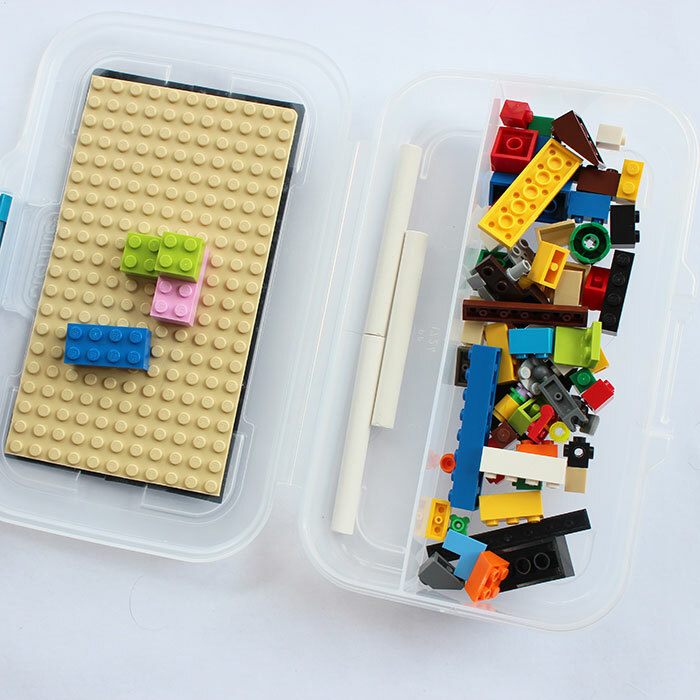 Fill the smaller compartment with chalk for drawing, and the larger area for your favorite LEGO bricks and minifigures. Now you're ready to hit the road! My boys were SO excited about their new LEGO boxes, and seriously played with them for the entire drive to the beach. Now that we are home, the LEGO boxes are still super popular. My boys love playing with them and we take them just about everywhere. It's the perfect portable activity for waiting at the doctor's office, or anywhere you need a quiet distraction. 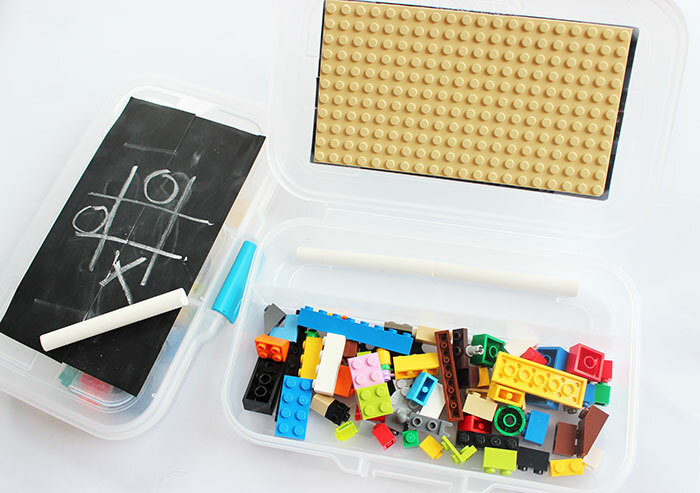 The pencil box works perfectly to give them both storage and building space, and it's easy to latch closed so no LEGOs are spilled in the car. We love them! 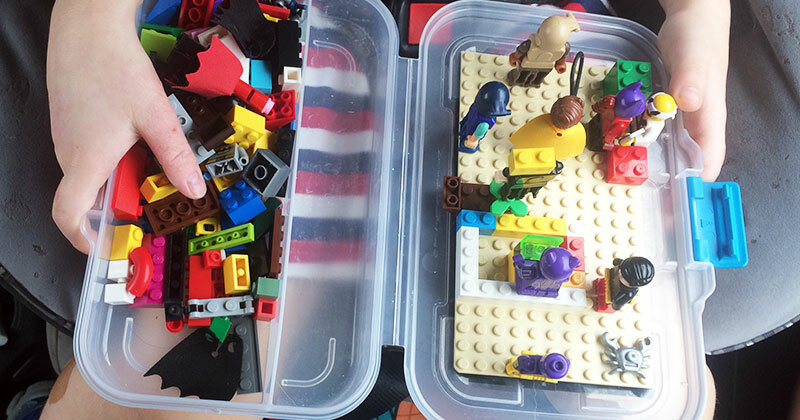 Do your kids love LEGO? 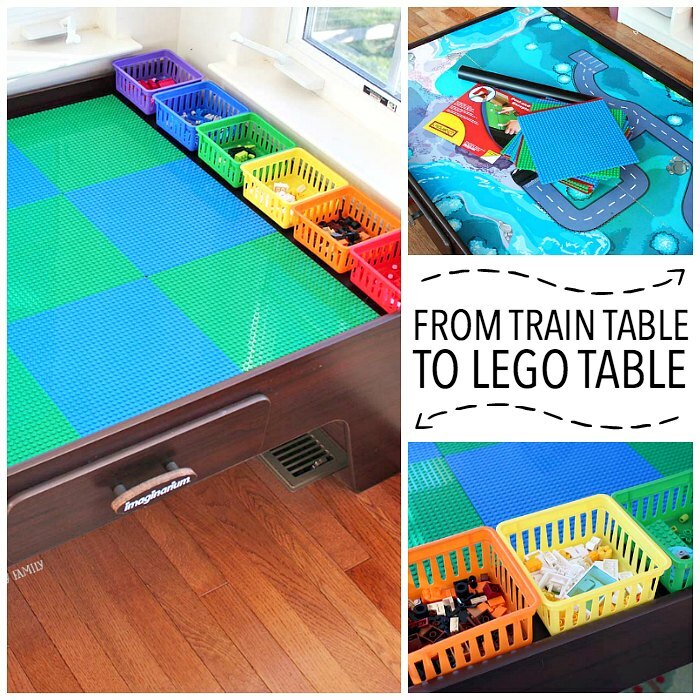 Check out how we turned our train table into a LEGO table (with storage!) here.